Every Maven project specifies its required dependencies in the pom.xml file. The AWS SDK for Java provides a Maven module for every service it supports. To use the Java client for a service, all you need to do is specify the group ID, artifact ID and the Maven module version in the dependencies section of pom.xml. 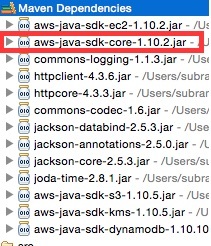 As you see, the aws-java-sdk-ec2 module is pulling in an older version of aws-java-sdk-core. This intermixing of different versions of SDK modules can create unexpected issues. To ensure that Maven pulls in the correct version of the dependencies, import the aws-java-sdk-bom into your dependency management section and specify your project’s dependencies, as shown below. The Maven version for each dependency will be resolved to the version specified in the BOM. Notice that when you are importing a BOM, you will need to mention the type as pom and the scope as import. 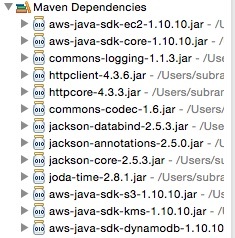 As you can see, all the AWS SDK for Java modules are resolved to a single Maven version. And upgrading to a newer version of the AWS SDK for Java requires you to change only the version of aws-java-sdk-bom module being imported. Have you been using modularized Maven modules in your project? Please leave your feedback in the comments.